On lazy wings of feather and foliage, the devil and the macaw glide through the warming air of a thawing Northumbria. For this weekend at least the shackles of winter seem thoroughly cast off. A thirsty summer beckons, a hazy siren in aviator shades singing out to us the promise of cool beers in the blazing sun. "... and on the cheap" she seems to sing, just as her song trails off into silence. Two of Oakham Ales' best products, their Green Devil IPA and their Scarlet Macaw pale ale, have made it to the shelves of Home Bargains, and probably other discount shops too. Writing a book that requires you to drink alone in Newcastle a lot is tough on the wallet so with an audible yelp your correspondent, at 17:59 on a Friday night, dashed into his local bargain shop and filled his arms with these beers, to the chagrin of the staff. At £1.19 and £1.00 a bottle respectively, it would be rude not to. 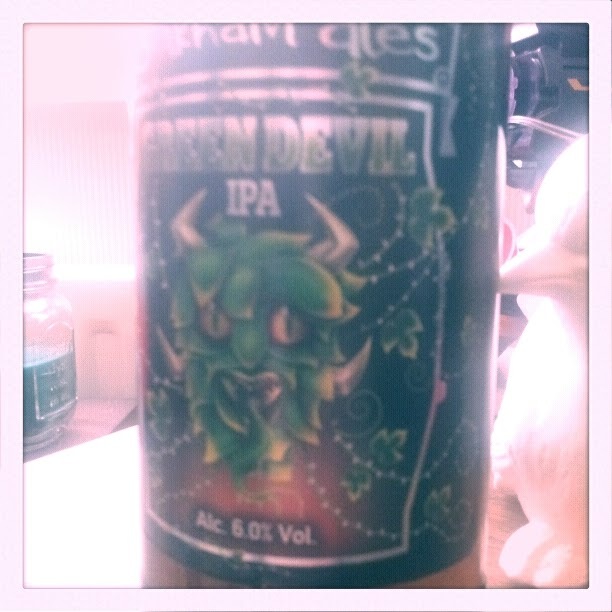 From the neck the breath of the Green Devil is fresh (but somehow still dank) and livid, a blast of mango and pineapple that seems to be electrified from some external source, as if somewhere at the bottom of the 500ml bottle is a tiny but incredibly powerful engine. Fiendish and consecutive huffs from the neck fill the lungs with nigh-perfect fruity freshness, a timely just-popped scent-spawn, as if the drinker has been transported to some mystical place where fruit is invented. It pours the colour of gold worth going to war over, with a medium-thick head of off-white, and the first mouthful is the sharp end of the omni-citrus, just-invented fruit scent that thrummed up the bottle's chimney. There is marmalade, bitter lemon, mango, pineapple and apricot, and the feeling is that this is a truly muscularly hopped beer. Steroid-swole tropical fruits pumping iron on some ludicrous muscle beach would be a good visual description of the taste, in contrast to Metropolis IBA's dying jungle of insane lizardmen banging and eating each other. It's easy, at this point, for the almost criminally-low price and cattle-prod-to-the-senses taste, to just go all in and begin hungrily gulping Green Devil down like someone released from a long stretch in Thirst Jail. 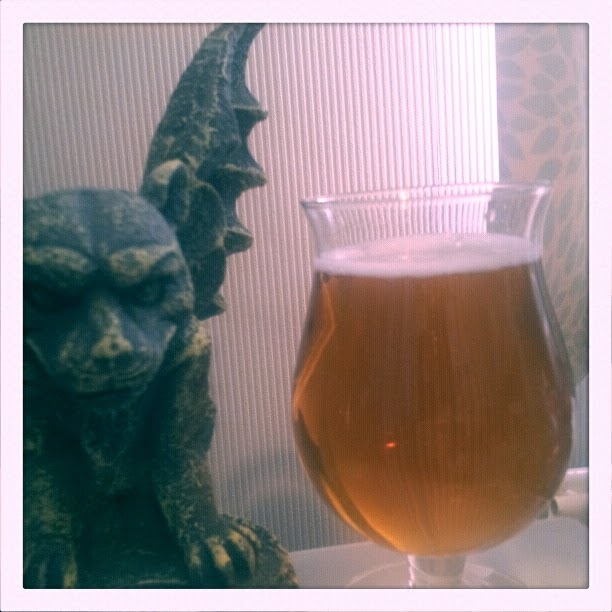 It took some willpower for me to stop for a moment and take in the scent from the glass, which is piney and grapefruity, but at this point it's tough to take it slow and scenty because every inhale is a moment you could be spending feeling the Devil's beer sizzle on the tongue. The final, careless mouthful that hurtles down the neck leaves an aftertaste of bitter marmalade and a spike in the temperature of the skull from the 6.0% abv. As the brain computes the damage done to it the Devil flies back to the hop fields, or maybe to the muscle beach. Or to the fridge, where three more of its kind await this slightly-less-thirsty writer. Pulling the head off Scarlet Macaw's neck makes for the scent of garden fruit, as gooseberries tumble skywards, gravity suddenly going the wrong way. Some oranges too, both bloody and bloodless, levitate with the gooseberries and soon the bottle is poured out, filling the glass with the dirty gold of failed civilisations. 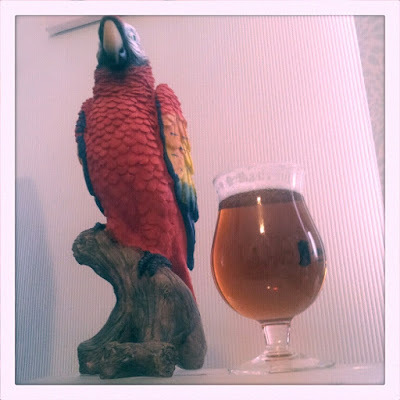 The head is rambunctious, almost escaping the glass, but diminishes as the gimmick-fond writer struggles to get a good shot of it and his big ol' parrot statue. The scent from the neck of the glass, the empty space between rim and beer already showing heavy foam lacing, is razor-sharp green fruits and green leaves, with some scrapings of yellow as a vague scent of sliced-up lemonflesh sneaks in. Unlike the Devil, there is more of a biscuity, hay-ish malty taste with the first bite. There is a spicy razor across the tongue and the pointed bitterness of a solicitor's letter as the fruit rind taste sinks in. The rising perfume of lemongrass meets the senses between mouthfuls of the increasingly sticky and relentlessly juicy pale ale. Necking mouthful after mouthful gives the feeling of trying to eat one's way out of a prison cell built ill-advisedly out of thick and rich fruit. The bitterness intensifies with the last couple of mouthfuls, offset by gushes of fruity juices as the hops and yeast do their mysterious and alchemical work of somehow turning a bunch of vegetable matter into a primal force of fruit, a seed-bearing winged thing that screams skyward as an aftertaste of fruit burns long on the senses like a tyre fire. 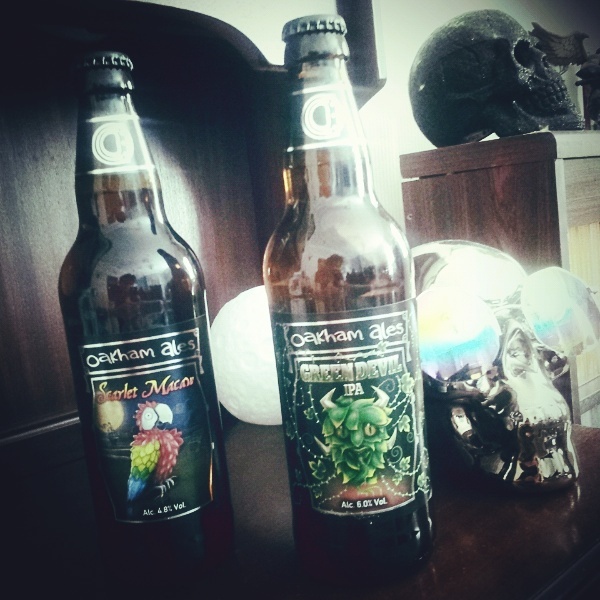 Oakham ales make undoubtedly good beers. You can read some of my thoughts on their Citra pale ale here. Something I think is great about this brewery is that I've never seen their products priced higher than maybe £1.50 a bottle. Citra often turns up in B&M Bargains and in corner shops. 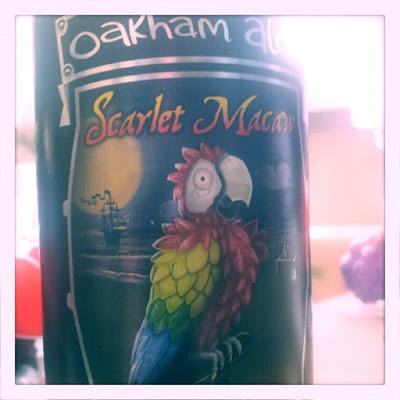 Still, even for the seemingly eternally low-priced Oakham stable, £1.19 for Green Devil and £1.00 for Scarlet Macaw is exciting and enough to make the wallet exclaim "yes, we can get pretty lit and still afford food this month". While budget outlets often shift beers that are close to their sell-by date, every one of these Oakham bottles I've had in my hands has a BBE of August this year. So go get 'em, if you want to start investing now in a cheaply-lubricated summer.